Cybersecurity is a very relevant topic throughout various news portal on the Internet sphere. As the cybercrime rate has been increasing slightly throughout the past years, every user needs to put some effort to ensure that the machine he/she is using is kept safe from different types of malware, phishing attempts, and data breaches. Even though manual protection is also a necessary measure that every user needs to take, some malicious content and activities might not be that easy to spot by a human eye, even by a highly-experienced person. That is why computer specialists have created and released a great variety of anti-malware tools which protect devices and machines 24/7. There have been many news articles released that provided information about recently widespread malware. One of the most popular threats distributed worldwide is GandCrab. This notorious ransomware virus has several variants that attack users when opening phishing email messages or surfing via third-party websites and clicking on free downloading links. Additionally, there have been many informative articles released about hackers misusing various worldwide company names such as Facebook via fake captcha. Additionally, potential actors manipulate victims by presenting themselves as a reputable organization, for example, a well-known health or airplane company. Bitdefender Total Security 2019 is an antivirus program which offers automatical protection not only for computers but also for mobile phone devices if the license key is purchased for a particular price. The list of the best anti-malware tools 2019 was expanded by adding Bitdefender's software because it has a big variety of useful features to offer. First of all, it has a great ransomware prevention feature which appears to be truly helpful due to the increasing rate of such cyber threat distribution. 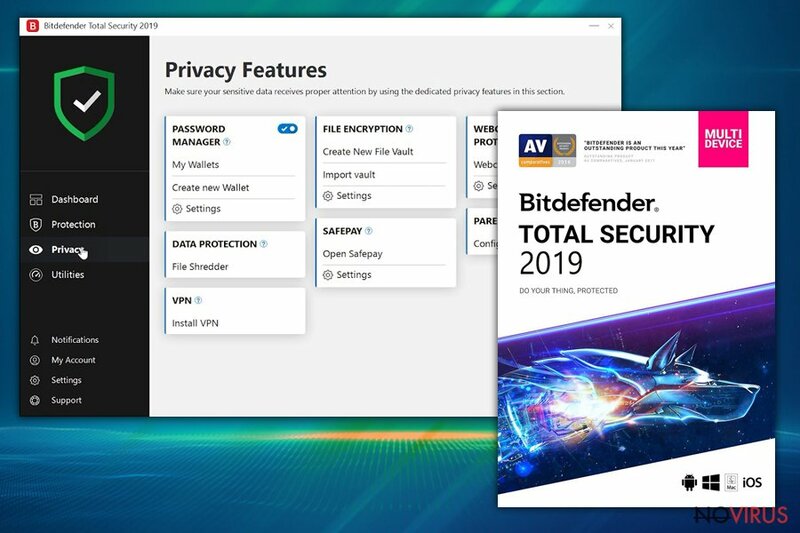 Continuously, Bitdefender Total Security 2019 offers automatical protection from phishing scams, data exposure, identity theft, webcam misusing. This program ensures that your browser is secured while surfing the Internet sphere and defends the system from possible infections. Despiting the fact that this anti-malware offers protection of your sensitive data, keeps your computer clean from various malware and infectious software, it also provides social network protection, and includes a Battery Mode to increase the lifetime of your machine's or device's battery. In order to try out such useful features, users are offered free 30-day usage of the anti-malware tool. Bitdefender Total Security was included as one of the best antivirus tools of 2019, not for no reason. This software was voted for 5.5 points out of 6 possible ones. 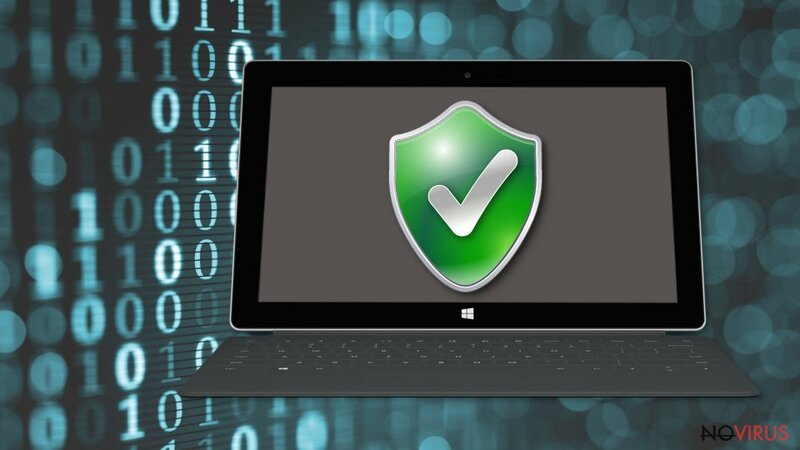 This makes the antivirus even more beneficial than Kaspersky, Symantec, and McAfee software. However, there are some minimum system requirements that need to be sure that can be fulfilled for the program to work successfully. Bitdefender Total Security antivirus works on Microsoft Windows which have the operating system in versions such as 10/8.1/8/7. Additionally, this tool needs 1.5 GB disk space available in order to install on the machine. 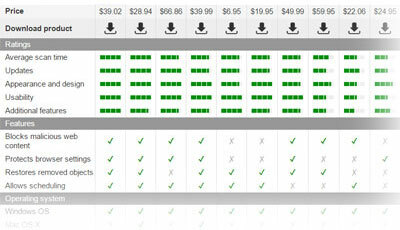 Talking about the price of the licensed version of the program, it is $44.99 of cost. Talking about Malwarebytes Premium, it is one of the most commonly used anti-malware software for different types of operating systems. This tool has a very big advantage that it works not only on Windows machines but also on Mac and Android. Additionally, it provides a free 14-day duration trial for trying out the program itself. A protection feature against system errors and flaws. System recovery after damaging cyber attacks. Malwarebytes Premium is one of the most advanced system tools that keep machines and devices protected 24/7. Due to this, it was included in the CRN Security 100 list for anti-malware programs. You can use the free version of this program as an additional component to your machine's security or activate the licensed version for $39.99 as the main tool for protection. It is known that Malwarebytes performs very quick and successful computer scans that take only 2.5 minutes of time. After the scanning process, users are provided with a list of possible errors on their machine/device. However, the scan might slow down your system a little bit but it is worth waiting those couple of minutes for an effective checkup. 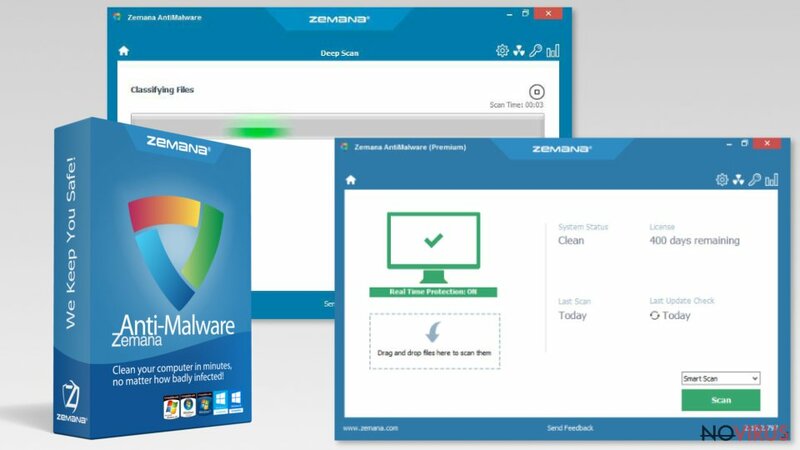 Zemana AntiMalware is an anti-malware tool created for the Windows operating system only. However, it is really useful software for removal of browser hijackers, adware applications, ransomware viruses, and other dangerous threat. The reliability of this program is shown by the OPSWAT Certification. This anti-malware software has a disadvantage related to the scanning function of the tool. About one and a half of an hour is needed to perform a system scan. This is a really long time of period comparing to other programs. However, this looks like to be not that bothering when you notice that the program takes only 6 MB of space when others take over a few GB. Continuously, its licensed version costs $24.95 and provides a big variety of protective features. For example, Zemana AntiMalware is capable of preventing zero-day flaws, highly-developed malware, rootkits, and other malicious software from showing up on the computer system. 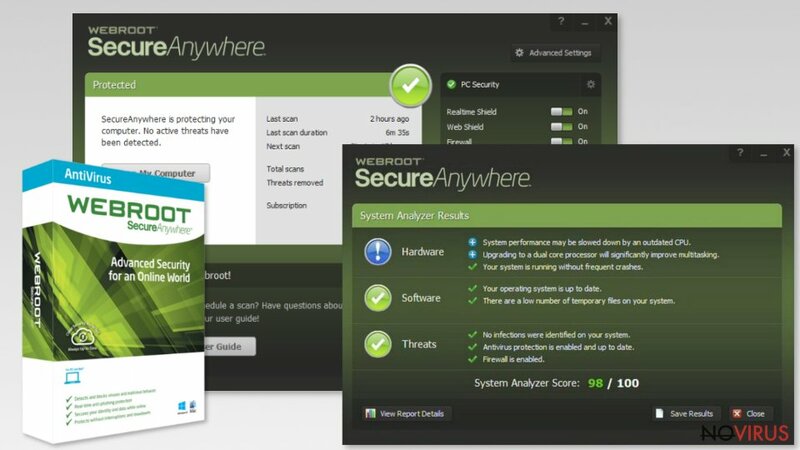 Webroot SecureAnywhere AntiVirus is a very popular and purchasable tool on the market sphere. The most advantageous feature of this software is its fast system scanning feature. A scan performed by Webroot takes only 20 seconds! By this scan, you will be able to detect malware-related signs on your machine/device. However, note that system scans can make an impact on the machine's performance. Around 30% of the Central Processing Unit might be used during the scan. However, it is only 20 seconds, so you will almost not feel a thing. What is more beneficial, less ten 1% CPU is being used by having the program on the computer and not scanning it. Webroot anti-malware can detect malicious software and content all over the system, it can offer malware protection, secure your web browser while completing surfing actions, and protect your private data from potential hackers. Additionally, the computer security tool needs only 15 MB of space on the machine. Emsisoft Anti-Malware is a tool that protects Windows systems from dangerous malware, including ransomware, Trojan horses, and potentially unwanted programs also. By preventing secret malware installation, Emsisoft ensures that no big or small damage is caused to the computer system. 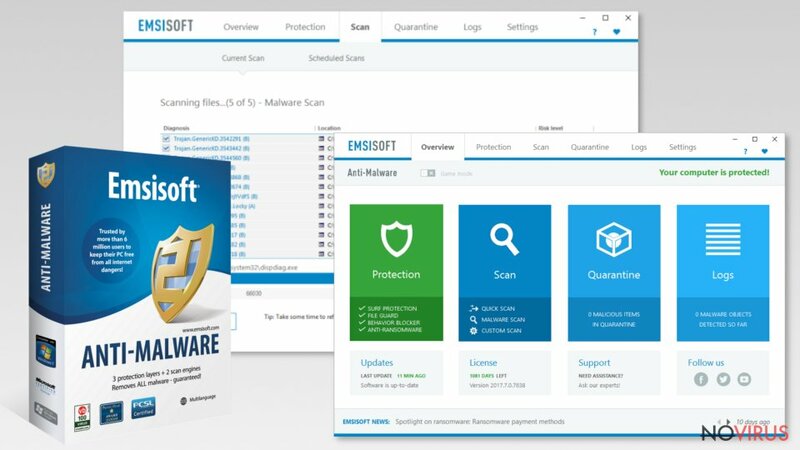 Emsisoft is one of the best anti-malware tools of 2019 for a reason. This anti-malware software uses a dual-engine for malware scanning and the combinations of two useful technologies – anti-malware and antivirus. 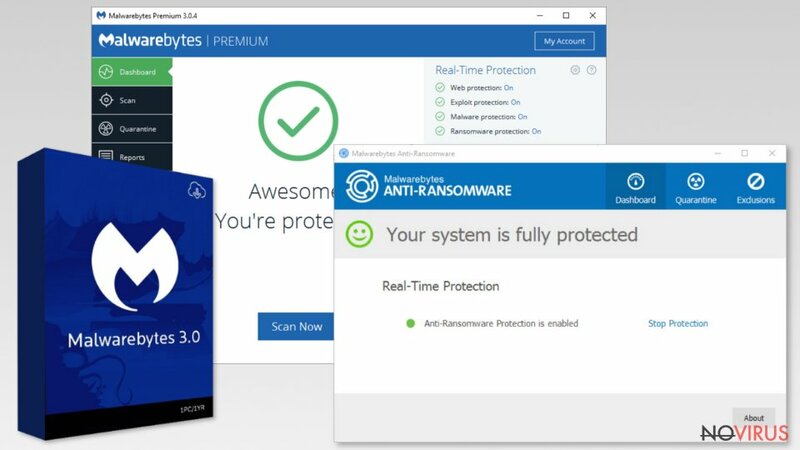 Additionally, this program is liked by users because they do not have to be afraid that a file-encrypting threat will block their files as the “ransomware detector” feature has been included in this tool. 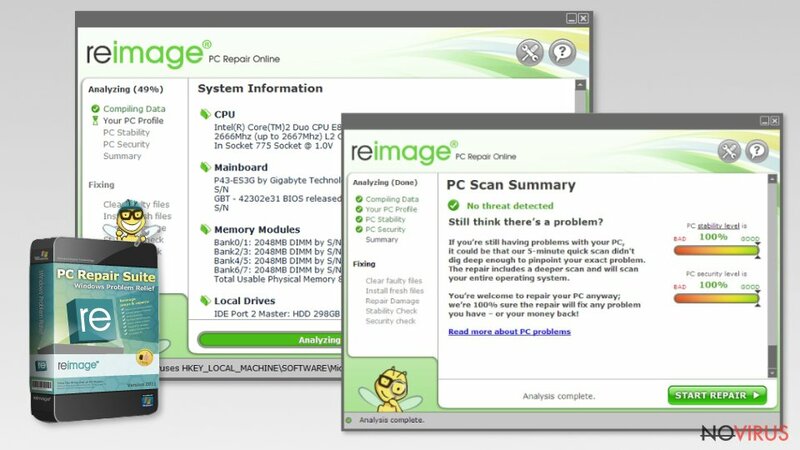 Reimage is a bonus computer tool which also was included at the end of the list of the best anti-malware programs. This beneficial application contains two relevant features – full computer repair, protection from malware and its removal. It is a very useful program if you have a damaged system which needs repairing after a cyber attack. The Reimage Repair tool uses Avira AntiVir engine for system scanning. It detects all corrupted entries, files. Also, it can spot dangerous malware infections such as ransomware, trojans, detect system errors such as blue screen of death, dll damage, system freezes and crashes, and other Windows-related flaws. Reimage includes 25,000,000 crucial components in its database and this content is used to fix all the damage that has been performed by dangerous malware. Also, the infected computer system can be cleaned from all hazardous components and returned back to its previous state. 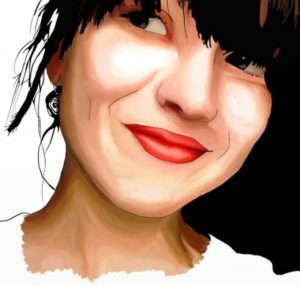 This post was published on 2019-04-07 at 13:53. Category: News, Security.